Today May 20, 2010, the United States Mint officially launched the Franklin Pierce Dollar into circulation. This coin represents the fourteenth release in the ongoing Presidential Dollar coin series, which honors the Presidents of the United States in the order served. The obverse of the Franklin Pierce Presidential Dollar features a portrait of the former President designed by Susan Gamble and engraved by Charles L. Vickers. Inscriptions include “Franklin Pierce”, the motto “In God We Trust”, “14th President”, the years served “1853-1857”. The reverse of the coin features a rendition of the Statue of Liberty by Don Everhart and the inscriptions “United United of America” and “$1”. The edge of each coin includes the date, mint mark, and motto “E Pluribus Unum”. An official launch ceremony was held this morning at Pierce Manse, the former President’s historic home in Concord, New Hampshire. The event included a ceremonial coin pour and a coin exchange available for attendees. 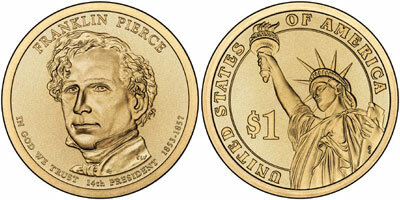 A free Franklin Pierce Presidential $1 Coin was given to children aged 18 and younger. At 12:00 Noon ET today, the United States Mint began sales of 25-coin rolls of Franklin Pierce Presidential Dollars from either the Philadelphia or Denver Mint. The rolls are packaged in US Mint branded wrappers, which indicate the President’s name, and the mint mark and face value of the contents. The rolls are offered at $35.95 each plus shipping and handling. The rolls can be purchased online at www.catalog.usmint.gov. Two additional Presidential Dollars will be issued this year featuring James Buchanan and Abraham Lincoln. The anticipated release dates are August 19, 2010 and November 18, 2010.